Asana puts conversations & tasks together, so you can get more done with less effort. Conversations are kept with your work, so you’ll spend less time in email, and more time getting things done. More often than not, when customers email you with a problem, you need to involve your team by creating tasks for them. 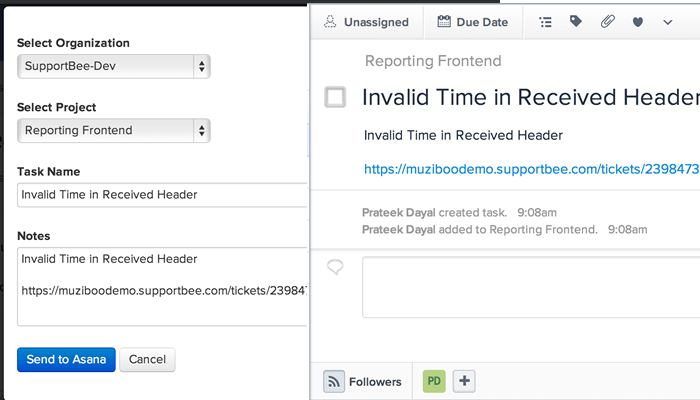 Instead of emailing them, you can create Asana tasks for them from within SupportBee using this integration. Tasks created using this integration contain the ticket content and also link back to the SupportBee ticket so your team has the right context before starting work. A link to the Asana task is also posted as a comment on the ticket so it's easy for you to find it later. If you are operating at any scale, you probably have multiple projects in Asana, possibly in several workspaces. Our Asana integration lets you select the workspace and project that you want to send the ticket to when you create a task. To add the Asana integration, simply click on the 'Add to My SupportBee'. You will be redirected to Asana where you can authorize SupportBee to talk to your Asana account. Once you have authorized the integration, click on Save Settings. To use the integration, open a ticket and click on Integrations > Send to Asana. You can select a workspace and we'll populate a list of projects for the selected workspace. Once you have selected a project, you can send the ticket to Asana. You can also edit the task title and description before sending it over. A link to the ticket is automatically added in the description.